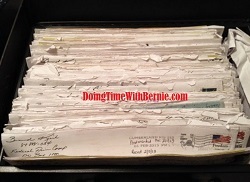 DoingTimeWithBernie.com: CNBC "Expert" Felon and High School Dropout Bernard Kerik thinks Nice is Paris! CNBC "Expert" Felon and High School Dropout Bernard Kerik thinks Nice is Paris! Will be appearing live in the 7AM hour on @CNBC on @SquawkCNBC to discuss #ParisAttack, #ISIS & #RadicalIslam. Please tune in. Will someone at CNBC.com please explain to dumb-as-a-box-of-rocks Felon on Probation Bernard Kerik that "Nice" is NOT "Paris"! Idiot Kerik, masquerading as a trusted terrorism "ex-spurt" then goes on to explain sharia law is practiced by radical islam yet King of Jordan Abdullah II, who claims to be a moderate Muslim, obeys "sharia law" ?! Wait...What? Felon Kerik was employed in the Middle East. Is Felon on federal supervised release, Bernard Kerik, still a friend of the United States?